George McFly had it right. Which is not to say I have any bone to pick with any one who uses the term “team of destiny” to describe the past month of Auburn football. As professor Jolley so ably wrote earlier this week, selecting the right clutch of words to accurately describe the end of that Iron Bowl — not to mention that Georgia game — not to mention how one followed after the other in a span of three Saturdays, is like going out to the mailbox and seeing that, oh, a family of yetis moved into the house across the street, they seem nice, and the next day at the mailbox the father is out walking the family manticore — it’s hard, man. “Team of destiny” is a bit hollow, more than a bit cliche, but we have to fill the void with something. “HOLY COW” and “OH MY GOD” aren’t even interesting by platitude standards, but Bramblett’s call is going to rattle in my ears the rest of life anyway, because that’s what my brain sounded like at that same moment Davis crossed the goal-line, too. “HOLY COW” and “OH MY GOD” are how my orange-and-blue-stained soul felt in that moment, and how every Auburn fan I’ve ever met felt, too, and it doesn’t matter how cornball that sounds when I say it’s the truth. “Team of destiny” is, in one sense, just Bramblett’s call come off the bender a few days later, in the hands of the neutrals shocked by the circumstances rather than Tiger fans overcome by the joy of that victory. I’m OK with it. But it doesn’t mean I like it. “Destiny,” to me, implies that there was never any outcome other than Louis turning his head at the last possible microsecond, never one aside from Davis buying the sideline a drink from across the bar and nothing but afterimage when it looks up to thank him. “Destiny” says that the college football gods all got together at the start of their eternal season, probably a little tipsy themselves, and wrote Auburn’s entire annis mirabilis down in a book. 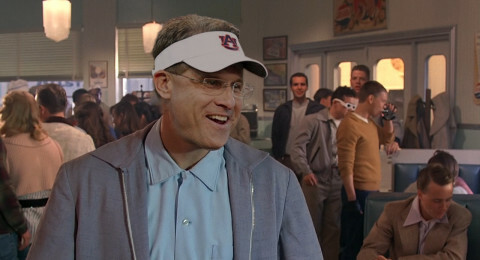 Malzahn never could have not been hired. Marshall’s prayer against the Bulldogs never could have been not answered. Griffith’s kick never could have not gone astray. “Destiny” implies that we’re just watching the highlight reel even as it’s happening, that every game is already its own CSS replay. That rankles, because it doesn’t give Auburn any agency in what’s happened. “Fate” is another word that’s been tossed about; it, too, suggests that the Tigers haven’t been masters of theirs. Yes, it’s obvious that raw, undiluted luck has played its part in this Auburn season. And yes, it’s equally obvious that only the strawiest of straw men and a certain subset of Alabama fans would argue that this Auburn season is a product of nothing but luck. Still: the Tigers in the 10-second Louis clip, poor Cade Foster’s misery montage on ESPN, the end of the Iron Bowl on YouTube — yeah,if you wanna call those guys a team of destiny, no complaints. The Tigers that built the 20-point lead on Georgia in the first place, though? Nick Marshall, Tre Mason, Corey Grant, and the offensive line in the Iron Bowl’s first quarter, dancing a routine so deceptive poor Landon Collins didn’t realize where the ball was until Marshall was 10, 20 yards behind him? Marcus Davis against A&M? Dee Ford finally lopping off the head of Aaron Murray, Unstoppable Zombie Monster? C.J Uzomah vs. Miss. St.? Robenson Therezie all the way back against Wazzu? Those Tigers didn’t play for a team whose destiny had been written already. They wrote it themselves. So I’m with George on this one. 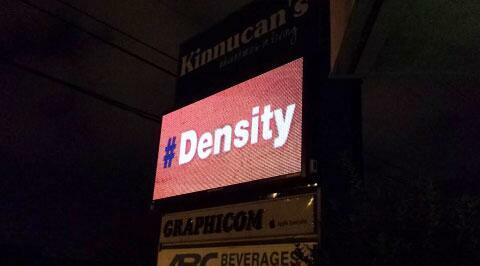 Call Auburn the team of density. Think of Chizik’s firing and Gus’s hiring as a dropped snowball on the top of the highest snow-covered hill in the world. It starts rolling, gently. Johnson signs on. Garner, Craig, too. It’s a little heavier, picks up a bit of speed. Montravius Adams signs, and Lawson and Johnson stick. Marshall arrives over the summer. It’s really starting to move down the hill now, the center packed hard. Tre Mason does Tre Mason things against Wazzu. Faster. Arkansas State is crushed. Faster. Marshall, who everyone still knows can’t throw, shreds Mississippi State to bail out the run game the only time it will need bailing. Faster. Therezie pick-sixes Dr. Bo and neither he nor any other Tiger looks back. Faster. Then Marshall hits Davis, Tre’s too good not to score, Kris’s little ol’ tug of the jersey-collar is apparently legal, and now, holy crap, it’s now more snow-boulder than snowball, roaring down the hillside, its core packed hard as iron. It mows down Arkansas. It crushes Tennessee. It is the size of a house. It is heavier by the minute. And … that bird, that flew over. Did it look like it had to work a little harder to stay aloft? Did it knock that tree over, or did it pass by and the tree was pulled over anyway? And now Marshall’s pass to Louis is in the air, and there’s basically no way to correlate the position of the ball, the two Bulldogs, and Louis such that anything good for Auburn happens. And yet those four objects are pulled by God only knows what forces into position such that a thing that is as good as anything that has ever happened to Auburn in a single play happens. And now it’s reached true ludicrous speed: power poles are flying out of the ground, planes are pulled from the sky, Baylor. But now comes Bama. And even after Foster’s first attempt is yanked a bit wide, it looks at half-a-dozen points like the Tide might be impervious to the physics of this kind of thing. But this is the thing that Gus Malzahn first cupped together in his hands a year ago and set on its way, padded by every name on his roster, propelled by every name on his staff, and it is moving at quantum speed, pure star-matter at its heart. And as the fourth quarter clock ticks away you watch the satellites plunge out of orbit to the Jordan-Hare Stadium turf, you see Sammie Coates dodge the remains of comets on his way to the end zone, but you still don’t know until Griffith’s kick goes up and you feel in your bones the very axis of the Earth tilt in such a way that a 56-yard attempted field goal comes up just a bit short, a bit wide, and lands in the arms of a senior from Woodlawn. At some point, Auburn will reach the bottom of the hill. It might very well be tomorrow. It might very well be not. (Can the tremors be felt in Indianapolis? I shouldn’t be curious. But I am.) Does it matter? Of course it matters. But whenever it happens, it won’t stop me from looking back up that impossibly long hill — remember that night against Texas A&M last year? — and retracing the path of this ridiculous team, one that bent the entire college football world around the curvature of its existence, one that warped the laws of this sport’s physics in ways even Cam’s and Bo’s and Pat’s could not. I am never going to stop retracing that path, in fact. Knowing that I won’t half fills me with crazed joy. The other half, of course, is the crazed hope that Auburn’s path can be cleared just a little further yet. Thanks for that. Just the shot in the arm that I needed before the game tomorrow. War Damn Eagle! Thank you so much Jerry, for taking the time out of your schedule to write this. I think I speak for everyone here when I say that you have been missed around here. Especially during a year like this. War eagle!